Steven Godsey grew up on the farm he still lives and works on near Bennington, and always tries to make it to the Mid America Farm Expo. 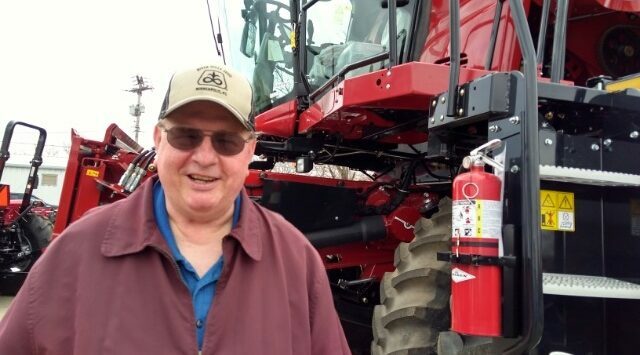 “I’m small potatoes …but I love looking at this big equipment,” he said as he inspected a 2019 Case IH combine on Thursday morning. The wrap up day, brought visitors and vendors together to talk about agriculture in Kansas and on the world stage. 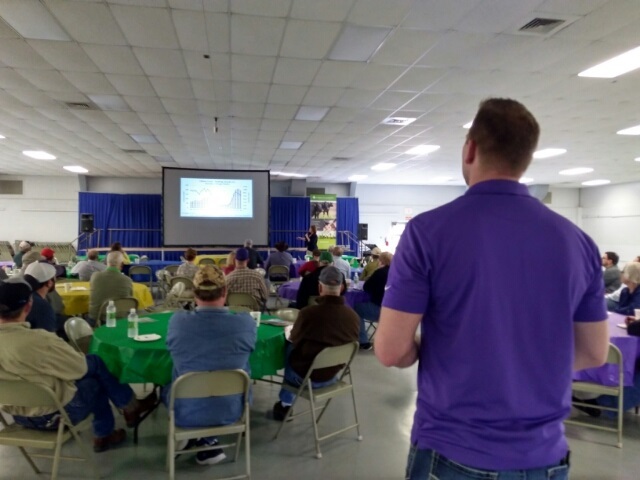 Naomi Blohm Stewart-Peterson gave producers a power point presentation Thursday morning that examined the livestock market, plus how recent flooding in the midwest and corn production and consumption in China will affect farming operations in Kansas. Willie the Wildcat was also on hand during the three-day event. 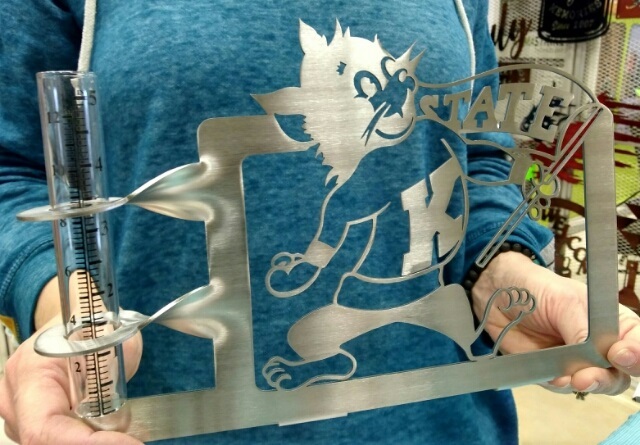 (Above) Shelly Ohlde holds a stainless steel rain gauge that her husband Todd, crafted and cut at their business in Linn, Kansas. 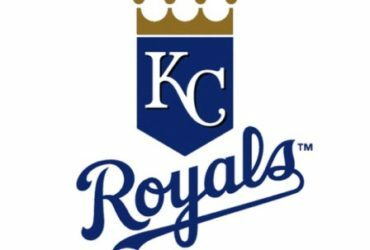 “We’re licensed with K-State and we make anything out of K-State as long as it is approved by Learfield, they let us do it,” owner Todd Ohlde said. Ohlde added the precise cuts that form dozens of sharp images are preformed not by a plasma torch, but with a laser at the Prairie Road Ironworks workshop. 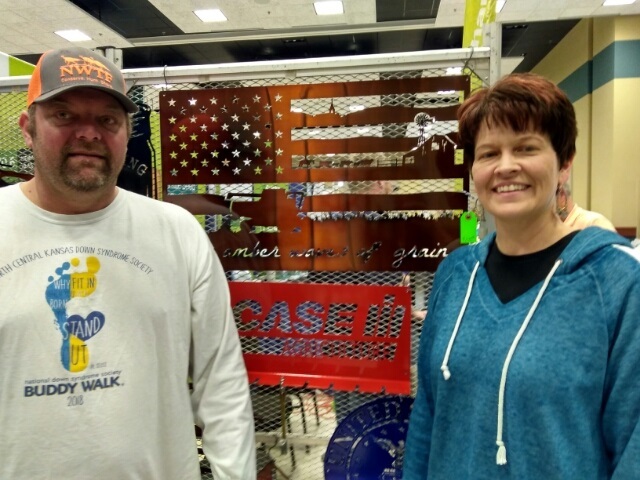 Todd and Shelly stand in front of their metal American Flag, with a church, plus farm and ranching scenes cut in the steel that shine through. The Mid America Farm Expo returns next year to the Tony’s Pizza Event Center and Saline County Livestock and Expo Center, on March 24 through March 26, 2020.